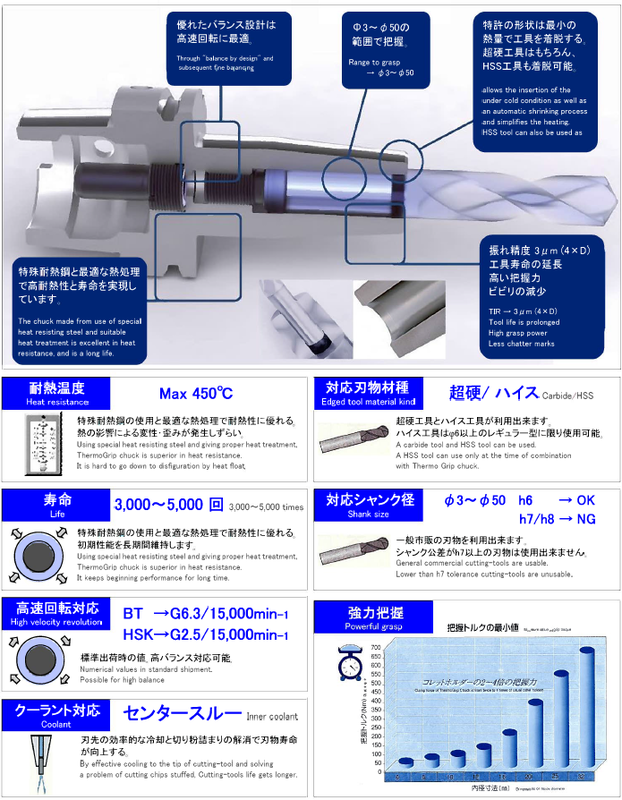 Thermo Grip is a tooling system that can grip cutting tools with high precision and gripping strength using the difference between coefficient of thermal expansion of the holder and that of cutting tools. You can change cutting tool quickly, safely, and easily without touching high temperature area owing to rapid heating and rapid cooling method realized by electromagnetic induction heating coil. 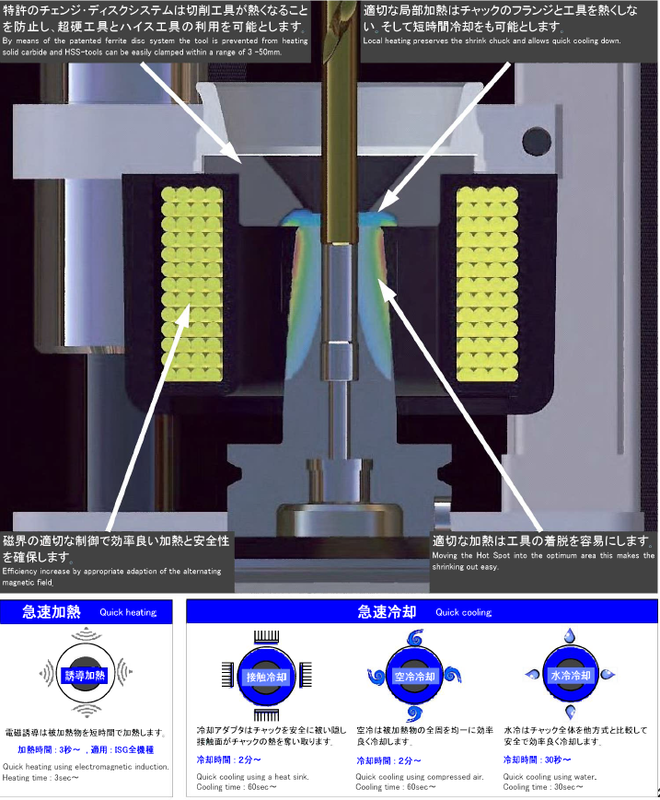 Slim and simple structure of Thermo Grip which does not use a collet and a nut to hold cutting tool can be widely used in various machining including die machining, high precision parts processing, high speed cutting, and etc. The chuck made from special heat resistant steel and optimal heat treatment realizes high standard heat resistance and long life span. This slim chuck with high gripping strength and high deflection accuracy is suitable for high efficient machining. 1, please use tooling whose shank tolerance is h6. There is a possibility of accidents including slipping or falling of tooling if you use h7/ h8 tolerance. 2, Do not use tooling with fractured shank and side lock tooling. They can cause low gripping strength, frequent runout, and fracture of the chuck. 3, Do not heat a chuck too much. Heating exceeding heat resistance temperature drastically shortens life span of the chuck. 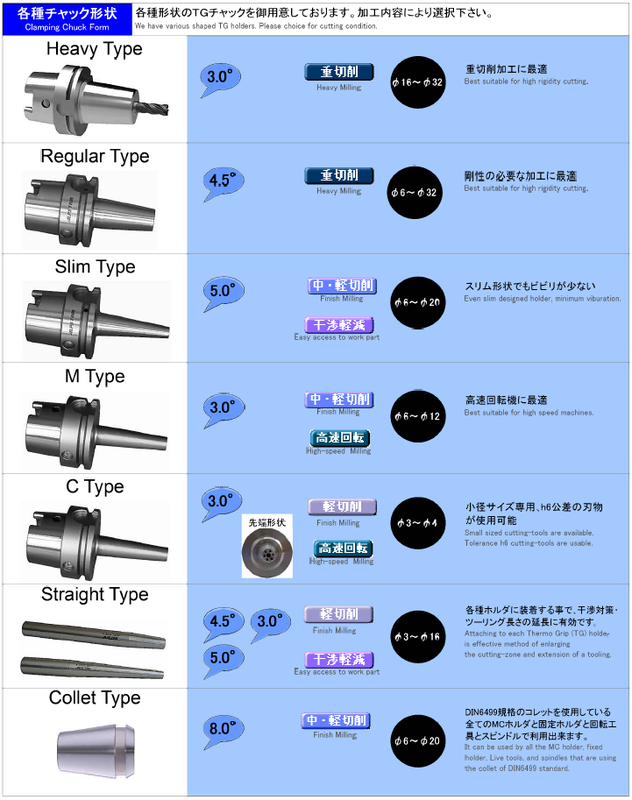 4, C type chuck is only for machine with electromagnetic induction heating coil. It cannot be used on air type heating device.